Do away with coal this season and present your sponsors with holiday event advertising that will knock their winter socks off! Santa LineUp Posters feature enough space to upload two of your own images to the template, like sponsor logos or pictures of jolly guests, next to a sweet toy Santa Claus poking his white beard out from a lineup of red suits. 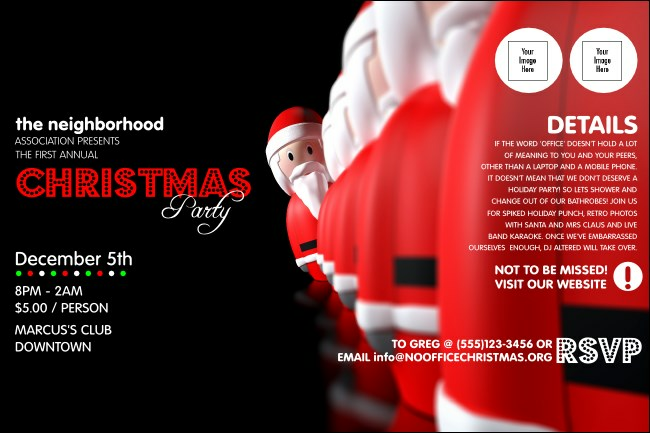 Don’t wait ‘til Christmas Eve to open your gift of great advertising from TicketPrinting.com.